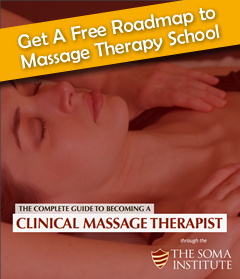 The Soma Institute's Publication "The Complete Guide to becoming a Clinical Massage Therapist" will show you detailed courses, timelines, career paths and more. Find out how easy it can be to become a Clinical Massage Therapist in under a year at The Soma Institute. Fill out the form below and we'll send you the E-Book for free so you can be on your way to a great new career right away!